California depends on federal funding to sustain a wide range of important public services and systems. In fact, more than $105 billion in the 2017-18 state budget comes from the federal government. While this is a sizeable amount, it’s important to also consider the dollars that flow the other way: from California to the federal government. Of course, events on the national level this year have drawn heightened attention to the ways in which California’s state and local governments rely on federal dollars to provide key services and support vulnerable families and individuals. On the one hand, the Trump Administration’s executive order attempting to withhold federal funding from “sanctuary cities” ultimately highlighted the fact that California actually receives relatively little in federal funds to support criminal justice services. On the other hand, proposals by Republican leaders in Congress to “repeal and replace” the Affordable Care Act have included slashing federal support for Medicaid. This would devastate Medi-Cal (the Medicaid program in California), which provides health insurance for individuals with low incomes, and blow a giant hole in our state budget. Overall, federal funds make up more than one-third of the state budget and more than one-seventh of county budgets statewide, showing that federal dollars are central to sustaining vital public systems and services across California. Moreover, billions more in federal funds go directly to California residents in the form of Social Security payments, housing subsidies, food assistance, and other benefits and supports. But it’s critical to underscore that the flow of federal dollars to California is not a one-way street. These federal dollars ultimately come from our nation’s taxpayers — including the more than 18 million California residents and businesses that pay federal taxes. In fact, a substantial share of total net federal tax revenues comes from California — more than $378 billion in federal fiscal year 2016, according to analysis by the California Budget & Policy Center. Collectively, California taxpayers contribute $1 in every $8 in total net federal tax revenues (see chart below). 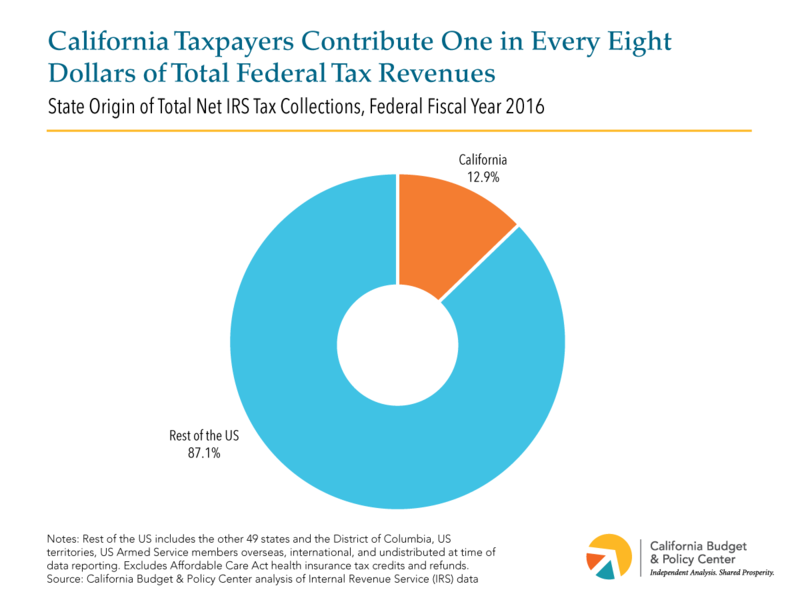 This major contribution to federal tax revenues holds true for both California’s individual taxpayers, who contribute more than $1 in every $7.75 of net federal individual income and payroll taxes, and for California’s businesses, which contribute nearly $1 in every $6.75 of net federal business income taxes. Moreover, California is in a class of its own compared to typical state contributions to federal tax revenues. California’s taxpayers collectively contribute more than one and a half times as much to net federal taxes compared to the state with the next-largest contribution, according to Budget Center analysis (see chart below). 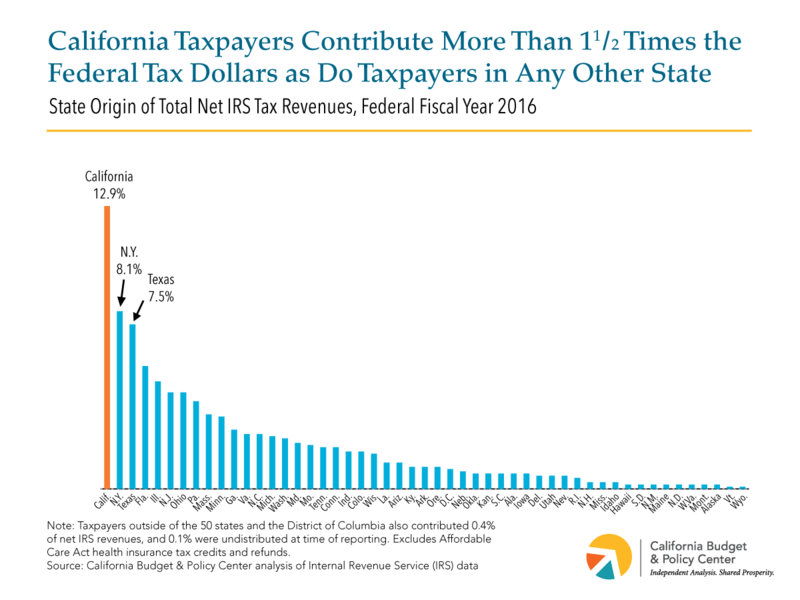 Why is California such a major contributor to federal tax revenues? Primarily because of the huge scale and relative strength of the state’s economy. 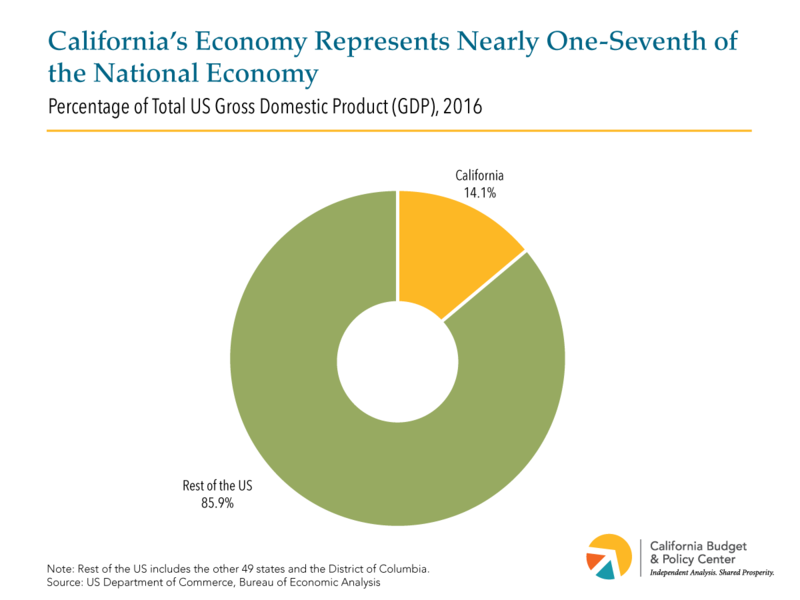 In 2016, California’s Gross Domestic Product (GDP), or the total value of all economic activity in the state, was about $2.6 trillion, while the total GDP for the United States as a whole was about $18.5 trillion. This means that California’s economy represents about one-seventh of the total US economy (see first chart below). Here as well, California is in a class of its own compared to other states. 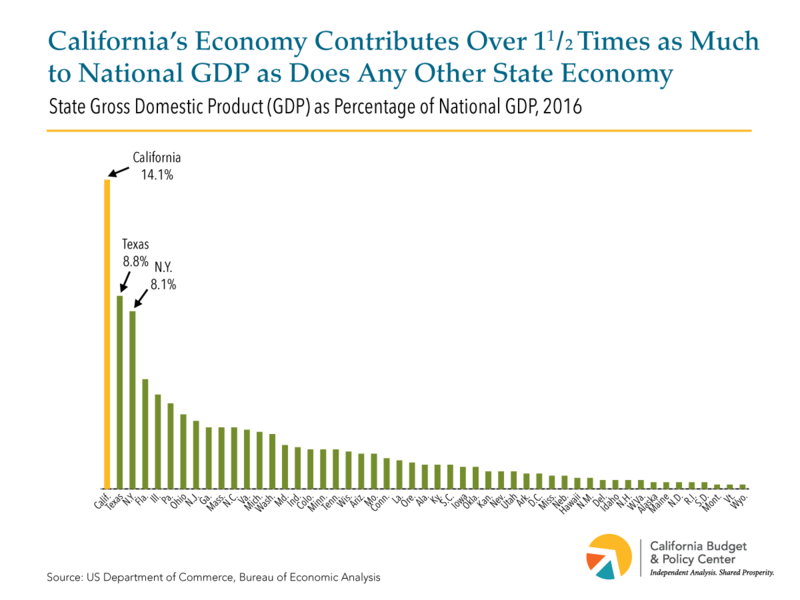 California contributes nearly one and a half times as much to national GDP as the state with the next-largest state economy, according to Budget Center analysis (see second chart below). Moreover, an outsized share of overall national economic growth in recent years is attributable to California’s strong economy — a full 22 percent of total growth in national GDP from 2012 to 2016 came from growth in California’s GDP, according to Budget Center analysis. Overall, California is truly unique among the 50 states in the size and strength of its state economy — and also in terms of its taxpayers’ collective contribution to federal tax revenues. At the same time, billions of dollars of federal funds flow back to California each year, supporting a substantial share of state and county budgets and the vital public services and systems they represent, including those for health care, food security, education, and financial support for families with low incomes, seniors, and people with disabilities. As Congress sets national spending priorities for next year’s federal budget, California’s Congressional delegation would do well to remember both the critical role of federal dollars in supporting vital services for Californians, as well as California’s key role in both driving the national economy and providing the revenues that support federal spending.